Palmdale, Calif. and Silver Spring, Md. 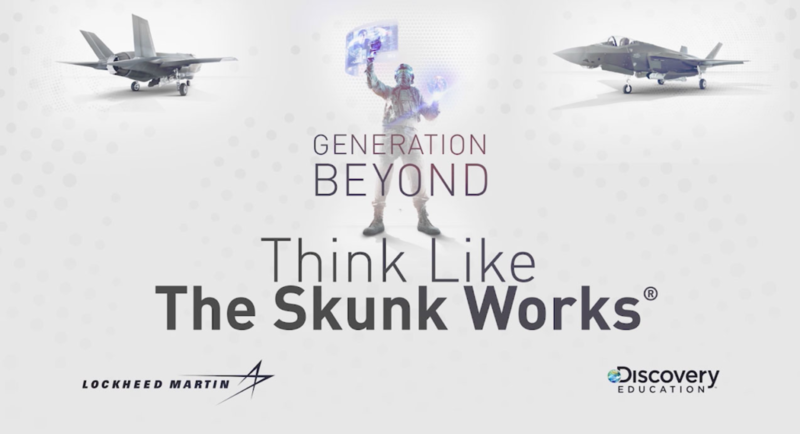 (Tuesday, December 4, 2018) – Lockheed Martin and Discovery Education, the leading provider of digital content and professional development for K-12 classrooms, today took high school students on a virtual field trip to Lockheed Martin Skunk Works,® where they learned about five advanced technology developments being pioneered by Lockheed Martin engineers and scientists, or “skunks,” who work there. The immersive experience was designed to introduce students to the exciting work a career in science, technology, engineering and math (STEM) can offer. The Virtual Field Trip is part of Lockheed Martin’s Generation Beyond STEM education program, a free, digital STEM education program used in thousands of U.S. classrooms. Launched in 2016 in partnership with Discovery Education, Generation Beyond puts students in the shoes of scientists and engineers to tackle real-world technology challenges and demonstrate the exciting work that a STEM education and career can offer. In addition to developing career-focused STEM education programs like Generation Beyond, Lockheed Martin has also invested $50 million in tax-reform savings to fund STEM scholarships and additional education initiatives, as well as $100 million to ensure our existing employees are prepared for jobs of the future through education and training opportunities. Generation Beyond resources are available at no-cost at generationbeyondinschool.com and are integrated into Discovery Education Streaming. For more information about Discovery Education’s digital content and professional development services, visit discoveryeducation.com. Stay connected with Discovery Education through social media on Facebook, Twitter, Instagram and Pinterest @DiscoveryEd. Headquartered in Bethesda, Maryland, Lockheed Martin is a global security and aerospace company that employs approximately 100,000 people worldwide and is principally engaged in the research, design, development, manufacture, integration and sustainment of advanced technology systems, products and services. This year, the company received three Edison Awards for groundbreaking innovations in autonomy, satellite technology and directed energy. Learn more at lockheedmartin.com.